Russia and South Korea: Towards a Strategic Partnership? 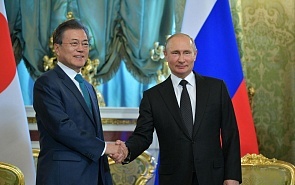 When Moon Jae-in became President of the Republic of Korea in May 2017, he designated Russia as one of Seoul’s priorities in its foreign policy towards great powers, alongside China, the United States and Japan. The new president was quick to appoint a special envoy to Russia in the person of his close associate Song Young-gil, an influential South Korean politician who also chairs the Presidential Committee on Northern Economic Cooperation. This body is in charge of carrying out Moon Jae-in’s New Northern Policy focused on expanding economic ties with Russia with a view to involving North Korea in this cooperation. In September 2017, Moon Jae-in attended the Eastern Economic Forum in Vladivostok, where he put forward the Nine Bridges initiative to step up cooperation with Russia. In June 2018, he undertook a three-day visit to Russia, including the first state visit to Moscow by a South Korean president in the past two decades, and was offered the honor of delivering a speech at the State Duma, the lower chamber of the Russian parliament The two countries are also expanding their military contacts. In late August, Deputy Defense Minister of the Republic of Korea visited Moscow, paving the way, among other things, to a decision to upgrade the strategic dialogue between Russia and South Korea to the level of deputy defense ministers. Why didn’t Moon Jae-in come to Vladivostok? Some expected the South Korean president to attend the Eastern Economic Forum in Vladivostok in 2018 as a sign of progress in bilateral relations. At least, Vladimir Putin sent him an invitation. However, Moon Jae-in preferred to stay in Seoul, and sent his Prime Minister Lee Nak-yeon to Russia instead. The fact that South Korea was represented at the Eastern Economic Forum at a lower level could be interpreted as a sign that Seoul currently believes that Russia is an important, but not the main actor on the Korean Peninsula. As a pragmatic politician, Moon Jae-in certainly understands that the United States and China are the great powers that are center stage as far as Korean affairs are concerned. At the same time, Russia and Japan as the two other key powers in Northeast Asia play what could be seen as a more peripheral role. In most instances related to the Korean Peninsula and North Korea Moscow tends to follow in Beijing’s footsteps, while Japan takes its cue from Washington. The fact that Moon Jae-in did not come to Vladivostok could be also indicative of Seoul’s satisfaction with Russia’s position on Korean affairs. Moscow consistently supports Moon Jae-in’s policy to promote intra-Korean dialogue and diplomacy. The lack of political disagreements between Moscow and Seoul removes the need for new top-level talks between Vladimir Putin and Moon Jae-in. Considered from this perspective, this creates a stark contrast between Russia-South Korea and Russia-Japan relations. Shinzo Abe attends the Eastern Economic Forum in Vladivostok every year, which can be explained by persisting challenges in Russia’s relations with Japan. The positive developments in Moscow’s relations with Seoul along the political track have so far failed to bring about any significant economic outcomes. Economic cooperation between our counties is still reduced to supplying Russian energy resources and raw materials to Korea in exchange for Korean cars, equipment and consumer goods. South Korean investors show little interest in Russia and its Far Eastern region despite the New Northern Policy announced by Seoul, the Nine Bridges initiative and the establishment of a dedicated presidential committee. It seems that the risks associated with Russia still outweigh the potential benefits for South Korean companies. In fact, there are still very few large-scale projects in Russia’s Far East involving South Korean companies. In the high-technology sector, Rosneft’s cooperation with Hyundai Heavy Industries to build a major shipyard in Bolshoi Kamen is probably the only notable project. However, this does not mean that South Korea is ready to invest in the project, since the role of its businesses is limited to that of contractors providing shipbuilding engineering services. The creation of a mineral fertilizer plant near Nakhodka is currently the largest bilateral project. It was initiated by the National Chemical Group, and joined by Hyundai as the main investor. Construction is expected to cost $6 billion by the time the plant is launched in 2022. The construction by Novatek of an LNG shipment terminal in Kamchatka is the second major project. KOGAS is very much interested in the Kamchatka LNG terminal. That said, the involvement of South Korean investors in these and other future projects is complicated by US sanctions against Russia. South Korean corporations are highly cautious and sensitive to sanctions-related risks, which makes it unlikely for South Korean companies and banks to promote business ties with Russia, if it could anger Washington. This creates a serious barrier, since the US sanctions cover the fuel and energy sector, finance and high technology, the very sectors where Russia would like to see more cooperation with South Korea. The only bright spot against this backdrop is the surge in inbound tourism to Vladivostok from South Korea. The main city in Russia’s Far East emerged as a popular destination among young South Korean tourists. Vladivostok is connected to South Korea by some 40 flights per week, and an entire industry has emerged in the city with a focus on serving South Korean tourists. This surge in tourist flows resulted from a visa free travel arrangement between the two countries for short-stay trips and the modernization of the Vladivostok airport for the APEC Leaders’ Meeting in 2012. From friendship towards a strategic partnership? While friendly in general, Moscow’s relations with Seoul are neither very close nor deep, despite the convergence of interests in a number of areas and the lack of reasons for reciprocal animosity. The main restrictive factor is South Korea’s status as a junior partner in its alliance with the United States. Accordingly, any substantial breakthrough in Russia’s relations with South Korea is unlikely as long as Seoul continues to depend on Washington in military and political terms. At the same time, there is an increasing body of evidence to suggest that South Korea is beginning to view its subordinate status in the alliance as a burden. Many South Koreans view the alliance with the United States, at least in its current form, as a humiliating indicator of deficient sovereignty. In fact, differences between Washington’s and Seoul’s geopolitical priorities are starting to crystalize. The United States seeks to maintain its dominance in East Asia, contain Beijing and denuclearize North Korea. At the same time, promoting intra-Korean dialogue and maintaining good relations across the region, primarily with China, is what matters for South Korea. The possibility of Seoul gradually distancing itself from its US patron has become quite plausible. If South Korea becomes a fully sovereign actor, this will create a new geopolitical landscape in which Russia could become one of its key partners. Unlike Washington or Beijing, Moscow is ready to build its relations with Seoul in the spirit of equality without designating senior or junior partners. Russia is keenly interested in ensuring that the Korean Peninsula is not dominated by a single great power, becoming an independent center of gravity instead. In this sense, a strategic partnership between Russia and Korea may well materialize moving forward.